Betsoft Gaming offers a 5 reel with 30 paylines slot game called lost 3D; the game is designed extremely well and is visually impressive in every aspect of the game. 3D Slots have become extremely popular within the online gambling industry and when Betsoft took it upon them to create a series of 3D Video slot games they did so with one big bang. The games have become popular all around the world and each game is crafted almost to perfection. The high amount of detail that comes out of the game is shown by the time and effort the developers put into this game. The graphics are visually appealing, the sound quality is superb and the game runs without a single hiccup. The theme of the game takes you back in time with a coliseum in ruins and a Pharaoh overlooking you play the game. 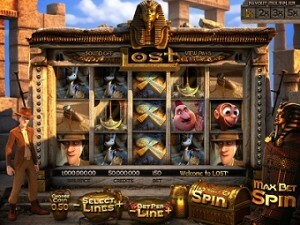 The symbols in the slot game match up well with the theme of the game. You will find symbols such as an Egyptian, a beetle, a horrifying mummy, a monkey and more. The more you click the spin button the more you will find yourself eager to continue on into the tomb that holds many riches for the players. Many slot games will offer features that try to blow a players mind out of the water but many online casinos will fail in doing this. Lost 3D does not even come close to failing at their feature options. You will find features such as scatter wins, multipliers, expanding wilds as 3 special features available to the players of their slot games. One thing you will soon pick up on is that when you hit a multiplier in lost 3D on a winning combination you’re win will be multiplied by 5 times its original amount. One of the first features you will notice in the lost 3D Game is their expanding center real. This begins to activate when you land on a third reel with the staff symbol. The entire third reel will cover up the rest of the entire reel and award you good money on any winning combination that you have landed on in the game. The second feature you will find of the three unique features that lost 3D has to offer is the “Click Me” feature. This feature will be triggered the moment you land on the fourth reel with a monkey symbol. This feature will allow you to choose from 6 different symbols and each symbol will award you will a different prize every single time. Than you will see a “Win All” button to select which will award you all of you’re six prizes and no matter what this feature will allow you to collect a certain prize on each box that you randomly choose from. The third and final feature will activate when you hit 4 or more scatter symbols. This feature when it has been fully activated will bring you to a special bonus game, in this bonus game you will help the oh so friendly Doctor Bones with what door to go through. If you keep on hitting the right doors you will get closer and closer to the pharaohs treasure. This bonus is by far the best one that lost 3D has to offer because of the many prizes that are up for grabs and with that said you should make you’re choices with caution because the right ones will increase you’re coin balance to an all new high. This is just another amazing game that is offered by the amazing Betsoft Gaming, the slot is thrilling and offers a ton of new excitement to old slot players. The game will always leave you wanting to play more of it and the game always brings back players because of the addiction that is felt when you play the game.